Miraculously recover or die. That’s the extent of our cultural bandwidth for chronic illness. The above quote is from S. Kelley Harwell. Btw, when you read this, remember that everything good I have done, I did with these issues alongside me, just as everything crappy I have done. I’m still just me. Living with chronic pain, fatigue (mentally, emotionally and physically) striving to be a loving, supportive wife, involved, caring mother and blossoming DIVA with many roles attached, is a challenging task. Sometimes I drop the ball all together. For those late to the party, I was diagnosed as having Bipolar Disorder when I was 14 as well as Generalised Anxiety Disorder. At 28 I was diagnosed with Ankolysing Spondylitis which most woman in my family has (including my 16-year-old daughter). 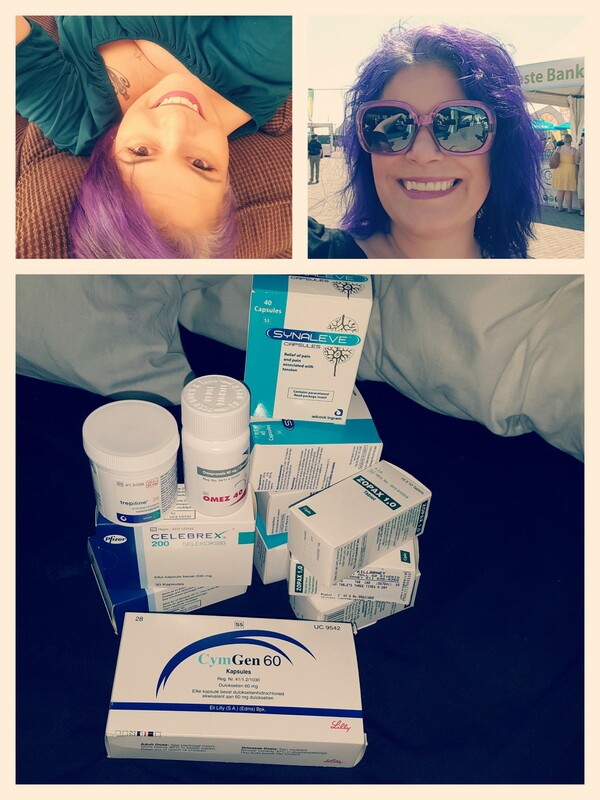 At 37 years of age, Fibromyalgia joined the party. The following year I stopped working in a corporate setting. Social Media found me and we have been in love ever since. Sitting for hours is impossible for me. It feel as if someone used me as target practice. I have a blade stuck between my shoulder blades. I can’t dislodge the stupid thing. A combination of meds is in place to make life as productive and dull ache instead of stabbing pain as possible. The bipolar part is very much stable with medication, anxiety remains an issue but living a life of not overstepping my physical limitations are much more difficult. I am HUGELY thankful for my husband who does his best to provide me with medical care, cooking a roast dinner and rubbing my back like he did yesterday. I don’t think it is easy to live with anyone who chronically is in pain, or has an illness that always needs consideration. My lower back makes itself known if I am in one position too long. Bending forward, carrying grocery packets, all simple tasks that equal pain. My body pains. My legs, arms and hips just hurt. Nothing happened to them. They have an illness onto themselves. One of the most annoying, irritating and completely insane things, is the pain and lack of grip in my hands. There are days I cannot grip a pen, open a water bottle or pour from a jug. Holding a phone, a book or even typing on a keyboard can become impossible. I hate that! The entire combination of symptoms leaves me with no point of escape. It is completely without warning for the most part. Ta da! I have great intentions but my body does not necessarily agree. Then, there are times I am just dandy. The pain becomes dull and doesn’t consume me. Medication controls, and I am awesome. My mental state is without any issues, my body is playing nicely and in those moments…. hours, days, weeks, or months… I get a huge amount done. I’m running around and living it! Unfortunately, the entire process is very unforgiving. For an awesome few days where I run flat out, it may take two weeks to recover and return to dull ache status. Previous Article Me and Godfrey and the friend who died. My last attempt at getting help was when the so called professional told me and my hubby that my pain is possibly in my mind because he couldn’t find anything on the scan. I suffer with pain in my abdomen every day and I have ups and downs often. Putting on the appropriate smile so that everyone else can cope better. In 2004 I had septicaemia after a doc burst my bladder and was given 20 percent chance to live. Since then I have never felt normal. I hurt and cry … always silently.